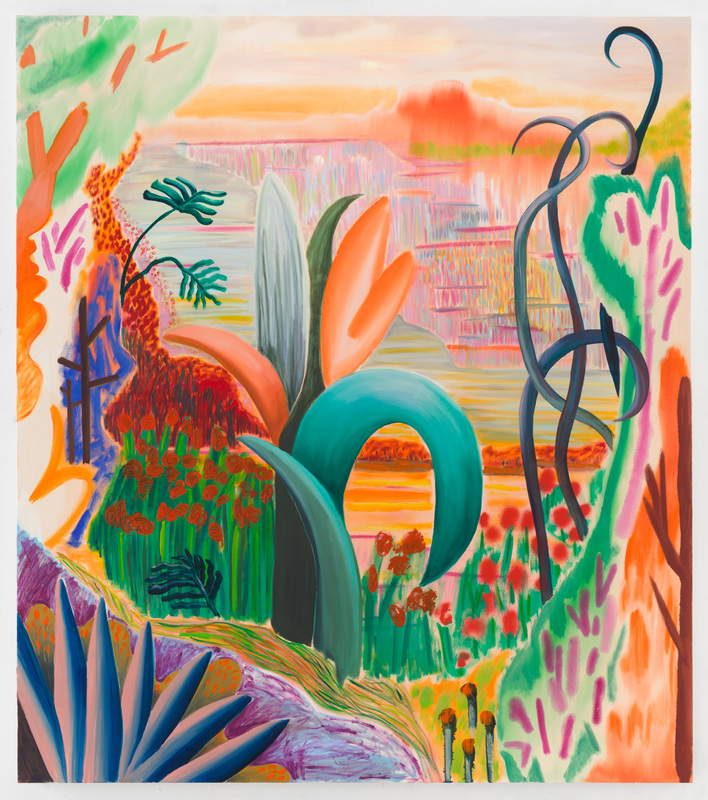 Come explore the magenta jungles, neon mountains, and peachy skies that make up the brilliant work of artist Shara Hughes. 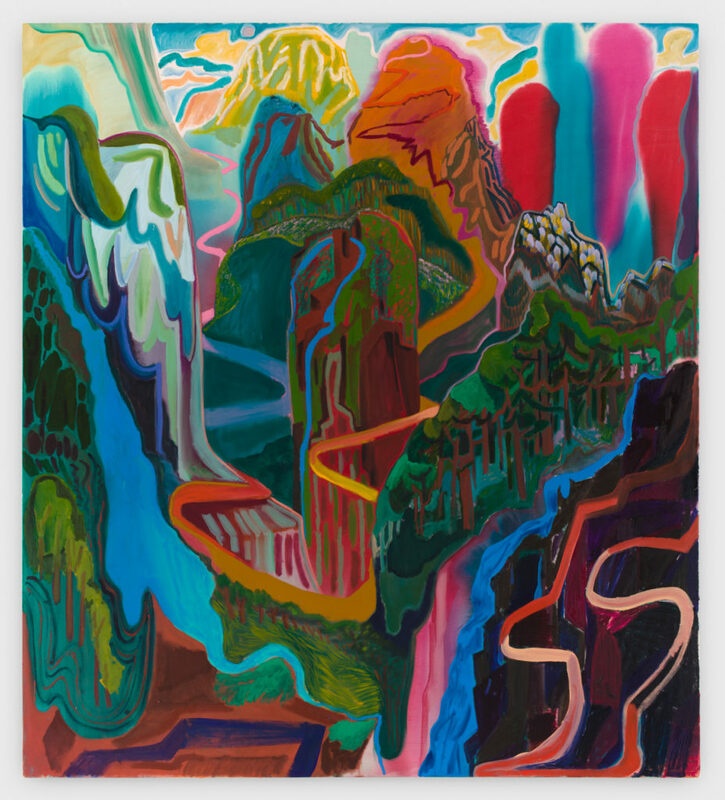 Fantastical hues loosely construct unique and lush scenes of nature, which offer a sharp contrast to the more traditional scene that you might be expecting when you hear the word ‘landscape’. 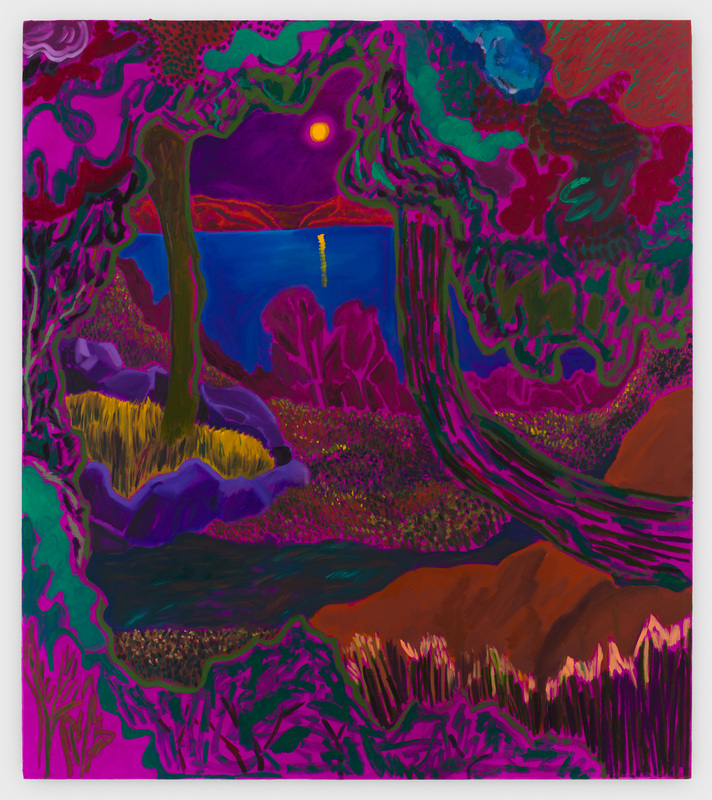 Instead, Hughes’ paintings depict mesmerizing and energetic landscapes, creating kaleidoscope dreams that evoke the wild compositions of Fauvist painters like Henri Matisse and André Derain. 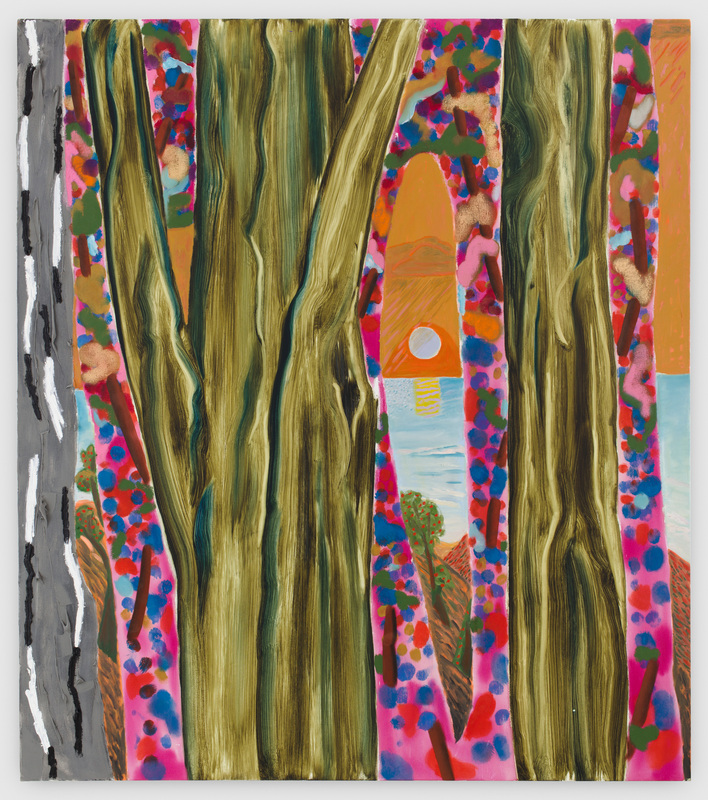 Each painting is a swarm of color, bold and bright, transforming the familiar forest or river into a scene of alien-like plant life where trees with violet leaves grow. Inspired by the endless complexity found in nature, the artist beautifully abstracts and reimagines our environment until she invents a world of her own. Originally from Atlanta, Hughes is currently based out of Brooklyn, NY. She has studied art at Rhode Island School of Design as well as the Skowhegan School of Painting and Sculpture. 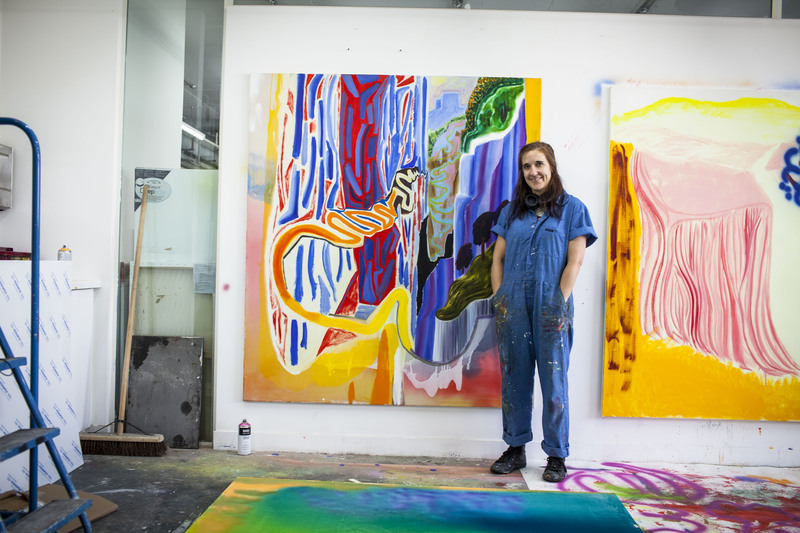 Join us as Hughes shares with us her experience working in different cities and environments, the evolution and development of subject matter in her work, and the freedom she finds in painting nature. AMM: When did you first consider yourself to be an artist? Was there a specific moment in which you felt a certain validation, or did you always feel that this was what you were meant to do? SH: I feel like my mom would be better at answering that! I don’t know if there was a specific day that I felt like I could really declare myself an artist. I think I wanted to be an actor when I was little, which is hilarious because I’m really camera shy. I think maybe when I went to art school — maybe that meant I was an artist — or maybe when I had my first show in a NYC gallery in 2005. That seemed pretty solid. AMM: Your work has a specific expression that is both unique and refreshing. How long did it take you to develop your distinct aesthetic voice? Did you ever experiment with other painting styles? SH: I don’t know how long it took. I’ve been out of college since 2004, so I guess maybe around then is when I felt like I was really starting to make paintings that reflected my specific voice. I was making interiors for about 10 years and then had a brief few years of using abstracted figures in the interiors. So really, I had been making interiors way longer than the landscapes. At the same time, I do still see the landscapes as interiors. The work is all still connected, I think I just found more freedom in the landscapes, but who knows; that all may change at any point. I try not to control anything too much. AMM: As many of your compositions are of lavish, abstracted landscapes, what role does nature play in your work? SH: I’m really interested in nature because we will never see the same thing twice. It’s always changing whether it’s time of day, mood, temperature, new life or death. Because it’s alive and moving, it gives me the freedom to really play around. I also think it’s kind of silly to try and compete with the beauty of nature, so in some ways, the paintings are very much also about painting and the history of painting; it allows me to talk about a few different subjects other than just beautiful landscapes. AMM: Are the scenes displayed in your paintings places you’ve been to, or are they depictions of another world, in between the familiar and the unknown? SH: My work is completely made up on the spot when I’m making the paintings. They aren’t places I’ve been to at all, nor are they dreams. I think of them as very abstract when I start each one and then they kind of just emerge from color, shape and textures. It keeps them fresh and challenging to me. AMM: The wild colors and flattened yet dynamic compositions bring to mind the art of the Fauve movement. Do you find a connection with any artists or movements from the past? SH: Sure. Of course, I’m always looking at artists from the past. How can we not? I’ve watched myself love and hate the same artist over and over which I think is super interesting. The way we see things is always changing, and I’m always interested in that kind of aliveness in the way we process images. It can change just by the way we allow them into our lives at different times in our lives. 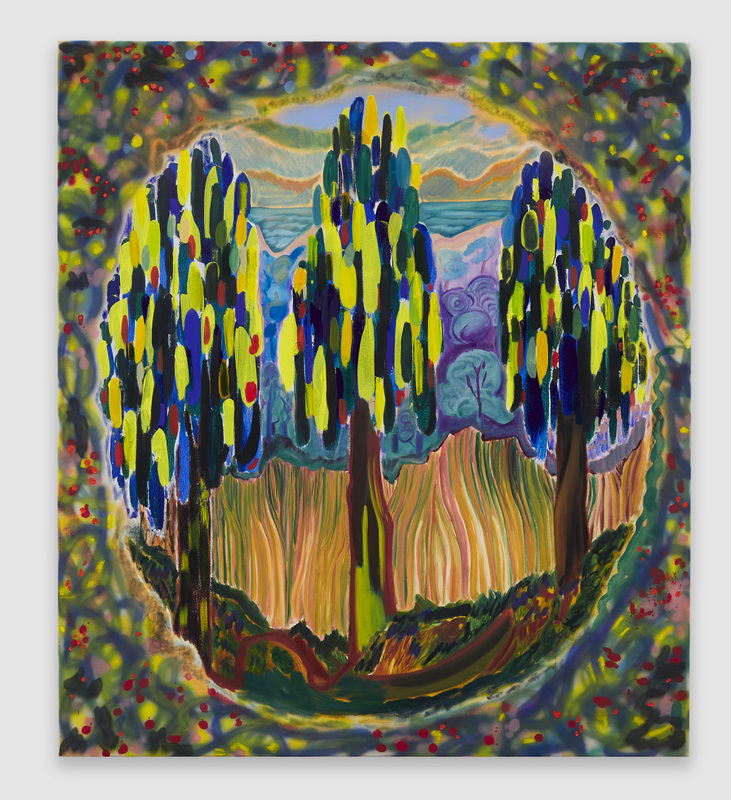 I could see an amazing Alex Katz or Milton Avery in college and completely pass it by, whereas now, I can’t get enough of it. AMM: Your sculptures are very different from your paintings and drawings. Can you tell us about your process creating these complex structures? SH: The sculptures really just seem like 3D versions of my paintings. I haven’t made many sculptures. The last time was in 2013 — I had a separate studio for making sculptures and a separate studio for painting. I don’t think I could make both in the same space. The sculptures at that point were made all at the same time over the course of several months. I saw the entire studio as if it were one big painting and I was organizing and moving the textures and colors all around until they found their right spots. I’d like to get back into making more sculptures — I just need more space. AMM: What is your ideal working environment? Do you find the most inspiring moments happen while working in your studio or out in the world? SH: My ideal working environment changes. I love being in New York; I live very close to my studio so that is pretty ideal for me. I do like to go to residencies, so the idea of working near a beach, or in another city, or somewhere in a beautiful landscape in a big barn would also be amazing. The most inspiring moments happen in my studio. Because I work so intuitively, I really can’t think too much about it when I’m outside of my studio. When I am out looking at shows and going to museums I get very inspired — it really just gives me the instant urge to get back to my own space to work almost immediately. I guess I have a mix of inspiration in the world and in the studio. AMM: You currently live in Brooklyn, New York. Have you always lived in NYC? How has working in this environment affected your artwork or process, or perhaps who you are as a person? SH: I grew up in Atlanta and have been moving all around since graduating from RISD. I’ve just lived in Brooklyn since 2014. Actually the environment doesn’t totally affect my process of working. Because I moved around doing residencies after college and changing studios, I taught myself to rely on the only constant thing in any place I’m at, which is myself. I feel like I adapt pretty well to different environments when I have a studio to work in. As much as I fear change, I like it because it’s challenging. Living in New York is always challenging. AMM: What would you consider to be your favorite moment as an artist? What has been your proudest accomplishment? 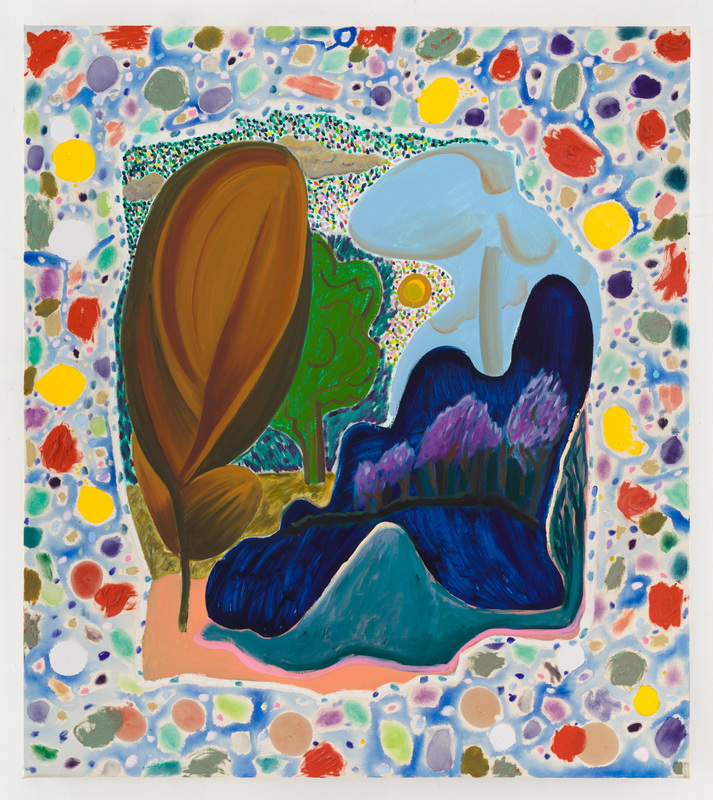 SH: The 2017 Whitney Biennial was pretty exciting for me. I was really honored to be a part of that show and couldn’t be more grateful to the curators for including me. AMM: If you were not creating art, what would you be doing? SH: I want to say breeding dogs, but I think that is probably more complicated than playing with puppies. I really don’t know. I’m pretty stubborn, so I think ever since I wanted to be an artist I never really gave myself space to consider anything else. Introduction and interview by Christina Nafziger for ArtMaze Mag.